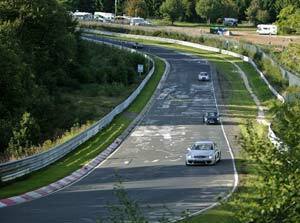 ABOVE: Tourists can drive on the Nürburgring's classic Nordschleife circuit at designated times, but a "race taxi" offers a much faster and more exciting experience. The Nürburgring, long known to motor racers as "the Green Hell," is Germany's most famous racetrack and one of the most legendary auto-racing circuits in the world. The track, which opened in 1927, lies 90 km (60 miles) southwest of Cologne near the spa town of Bad Neunahr-Ahrweiler, in a forested setting beneath an ancient volcano. With two race circuits, a racing museum, 100 races, 200 other events, and some 2 million visitors per year, the Nürburgring is one of the premier automotive attractions in Germany. It's well worth a side trip from Cologne or Bonn, especially if you do what I did and ride sidekick with a professional driver in a "race taxi" on the Nordschleife, the Nürburgring's original Formula I circuit that now doubles as a ractrack and a high-speed test circuit for German car companies, tire manufacturers, and automotive magazines.